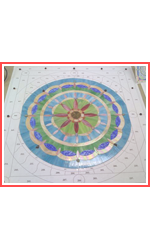 Chapel Window, 40" x 43" semi-precious stones with a pyrite sun center. 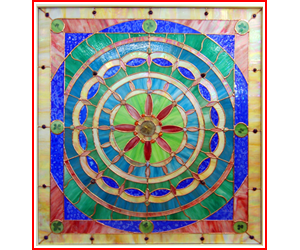 Based upon the eastern Mandala concept of visual prayer and design. Mottled opalescent, iridescent opals. 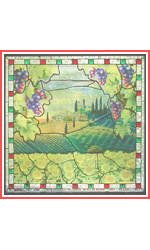 Tuscany scene using traditional stained glass border made of 1" square glass jewels, and Confetti glass. 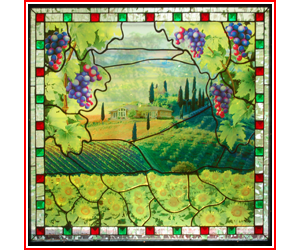 The entire Image Glass interior is a composition using an image of the clients actual Tuscany home, and photography of sunflower fields and Italian vinyards. Illustrative grape cluster and leaves frame the vinette. The piece was finished with my trade mark burned wooden frame, and now sub-hangs, by chain in the home, custom fit to an interior window. 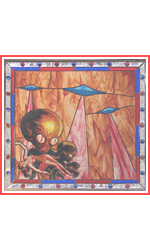 This piece is a mixed media art and image glass. 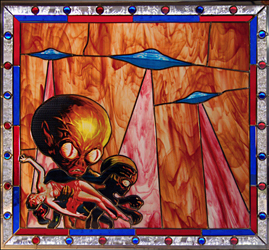 Inspired by the 1957 film 'Invasion of the Saucer-Men' and the Poster Art. 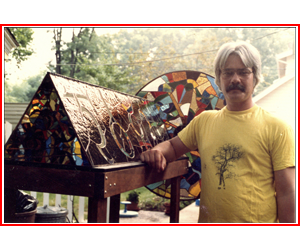 This was the first piece of its kind to combine image glass with traditional stained glass techniques. This huge transom was a collaboration between client and artist using his ideas to develop the composition to enhance an interior window opening to his bone room collection. 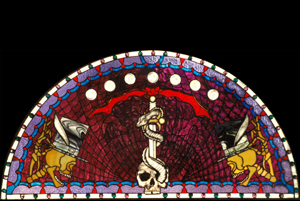 The skull, sword, serpent, and feathers in the top hats are kiln fired painted glass, with the glass border being studed with glass lenses. Mostly antique stained glass, the piece also contains seven clear faceted glass jewels. This project was a collaboration between myself, and Warner Brothers grand Two-way Interactive experiment "Qube". Once used for segway video and visual interest during their 21 hours of live weekly programming. Here you will find a more in depth review of current projects and past commissions. Highlights of the construction process, detailed imagery of the process, and more detailed descriptions of each piece.